Card: Follow Your Dreams – from the Healing with the Faeries oracle cards by Doreen Virtue. “Sometimes it’s difficult to know what you truly desire. You have so many outside influences, as well as personal fears, tugging at you, demanding, “Pay attention to me!” You wait for a free moment that you could devote to your dreams, goals and aspirations. Yet that moment never seems to arrive. The faeries ask you to take charge of your schedule. First, they ask you to meditate on your heart’s desire. Make a list of five priorities in your life. Then write down a schedule – in ink – so that you spend the necessary time engaged in these activities. It’s not important what you specifically do during these times; what’s most important is that you invest time and energy in that which makes you happy and fulfilled. 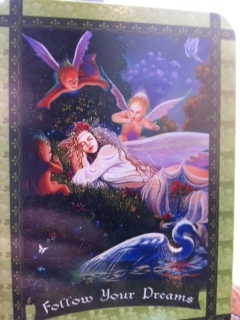 Message from the Faeries: The faerie that is sleeping in this card is dreaming of all her heart’s desires and the other faeries surrounding her are listening in on her dreams so that they can help make her dreams come true. This is what we do! We are listening in on your daydreams, we are hearing your prayers and we are paying attention to your heart’s desires. We are listening and we are ready at all moments, waiting to help you fulfill your dreams. Once you put it out the Universe what it is that you want, we are making all the arrangements to make it happen. The only thing that is going to stop you from receiving all the things that you want is yourself. If you are not open, you can not receive all the gifts that we bring for you. Make time and space in your life to receive all of your blessings. Or not…it’s totally up to you! We want you to have everything that you want. We want your dreams to come true. So, tell us what you really want. Whisper it into our ear. We are listening. Open your hearts and dream big!